Even though a pending court case could jeopardize its planned action, the Central Valley Regional Water Quality Control Board went ahead April 25 with a Fresno workshop that made clear the issue is far from resolved publicly. A tentative decision was issued in a case brought against the Regional Board by environmental groups. Sacramento Superior Court Judge Timothy Frawley’s tentative ruling, expected to be finalized in July, found the environmental impact report that underpins the proposed monitoring program is “inadequate” and calls for a new report to be prepared and circulated for public comment, the California Farm Bureau Federation’s Ag Alert reported. In the meantime, the judge ordered the existing Irrigated Lands Regulatory Program to remain in place. Several agriculturalists in the audience of less than 100 objected to the Fresno discussion taking place but the session went ahead. Objections were again raised by farmers to the Irrigated Lands Regulatory Program’s costs and mandates that would accompany addition of groundwater monitoring requirements to existing surface water monitoring rules. In the southern San Joaquin Valley, proposed regulations for the Tulare Lake Basin region would affect farm operations on about 2.9 million acres, with an additional 350,000 acres covered under a separate dairy order. A similar general order has already been put in place in the eastern San Joaquin River watershed, including parts of Madera, Merced and Stanislaus counties. As at past Regional Board workshops in Tulare and Bakersfield, farmers in Fresno complained about the board’s most recent estimate of annual program costs, about $20 an acre. Those annual estimated costs do not include additional investment in equipment or infrastructure for best management practices to control discharges. Ag Alert reported Tulare County Farm Bureau Executive Director Patricia Stever Blattler said some farmers calculated that program and compliance costs could total more than $100,000 a year. The Regional Board staff said compliance costs could vary widely. A major safety of dams project has been completed by Pacific Gas and Electric Company on its Crane Valley Dam. Conditions at Bass Lake in Madera County are getting back to normal. Restrictions on reservoir storage have ended. Capacity is back up to 45,600 acre feet. PG&E said the seismic retrofit project will improve Crane Valley Dam’s ability to safely withstand earthquakes. The dam, oldest such facility still in use on the San Joaquin River, controls Willow Creek, a San Joaquin tributary. The dam was built in stages between 1902 and 1911 to form what is formally known as Crane Valley Reservoir, but is nearly always referred to as Bass Lake. In 2002, the State Division of Safety of Dams asked PG&E to revise the dam’s previous seismic stability analysis. Results indicated that modifications were necessary. Analysis showed that in the event of an earthquake, the dam could slump and allow water to flow over the top, causing flooding downstream. Approximately 253,000 cubic yards of rock fill were added to selected areas on the upstream and downstream faces of the dam and rockfill buttresses were installed along with fill on both the upstream and downstream sides of a concrete core wall. The dam’s crest was raised seven feet, to an elevation of 3,387 feet, to provide more freeboard. PG&E generates power in a string of five power plants from Bass Lake to the San Joaquin River above Millerton Lake. It is one of the world’s oldest hydroelectric projects. 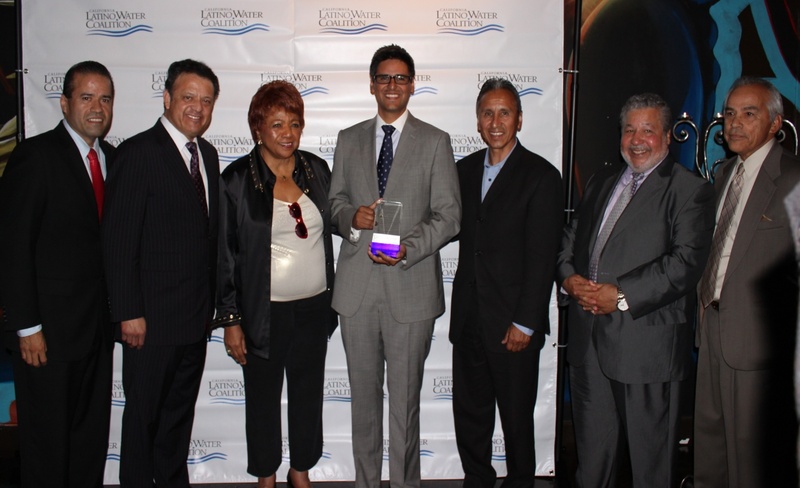 Assemblyman Henry T. Perea (center) of Fresno receives the California Latino Water Coalition’s 2013 Water Leadership Award during a Sacramento ceremony. He is the CLWC’s Central California Chairman. With him are (from left) CLWC Vice Chairman Ruben Guerra, Chairman Paul Rodriguez, California NAACP President Alice Hoffman, Assemblyman Perea, his father and Fresno County Supervisor Henry Perea, CLWC Coastal Chairman Tony Estremera; and CLWC Southern California Chairman S.R. (Al) Lopez.